A very decadent and exciting dessert. A mouthful of all the components together tastes exactly like a chocolate eclair! superb! Preheat oven to 200 C (180 C fan-forced). Lightly grease a rectangle baking dish (about 30cm by 20). Meanwhile, prepare filling. Whip softened cream cheese in a bowl. In a separate bowl make the vanilla pudding. Make sure you put vanilla pudding in the fridge to thicken up before adding to cream cheese mixture. Once pudding is thick, gradually mix in with cream cheese until there are no lumps and both are well combined. Put in the fridge to cool. When the pastry/crust has completely cooled, pour filling in. 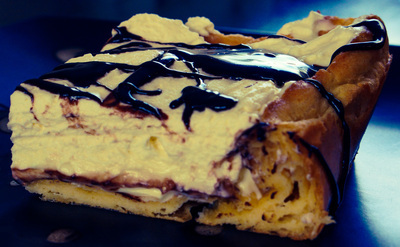 Top with a layer of whipped cream and then drizzle with chocolate sauce. Serve straight away or keep in fridge until ready to eat. NOTE: the recipe I followed said to use chocolate sauce but I didn’t have any cocoa left to make one so I melted dark chocolate and added a little bit of unwhipped leftover cream to make it runnier and it worked perfectly. I actually think it would have tasted better than chocolate sauce!